We’re here with some good news once again! We’ve released multiple admins feature for companies and teams in the portal. What does that mean? Multiple admins feature allows having several admins in your company account. This simplifies company data usage and management as now not only a single person can administer team’s documents and other users. Although it’s a rather small change, it might make your life so much easier! So how does this work? 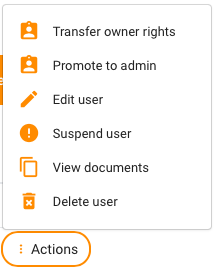 In Users tab in the settings, company account owner can choose to Transfer owner rights to another user or to Promote them to admin. Being an owner allows to manage all the things — edit, suspend or delete users, promote or demote others from admins, view other users’ documents, take care of billing, e.g., change plan or cancel subscription. In the meantime, admins have all the same rights to manage user accounts and documents as the owner, the only thing they won’t be able to do is change plans and manage subscriptions, as well as manage the account of the owner. One important thing though — if you transfer ownership rights to another user, this action is irreversible and you won’t be able to set yourself as an owner unless this other user transfers owner rights back to you. How did you come up with this feature? Well, in some teams it’s not enough to have one admin or owner who is the only one with the access to all the company data, thus, this feature eases your team’s headache when the owner is not available but some documents or statuses are still needed — from now on, any user with admin rights can access all the necessary information!